"This Greek-style pasta salad would also be good tossed with fresh avocado and mint." Bring a medium saucepan of lightly salted water to a boil. Add macaroni, and cook 8 to 10 minutes, or until al dente. Rinse under cold water to chill, and drain. Meanwhile, combine the chickpeas, tomatoes, onion, garlic, feta cheese, olives, salt, pepper, olive oil, and lemon juice in a large bowl. Set aside to marinate while the pasta is cooking. 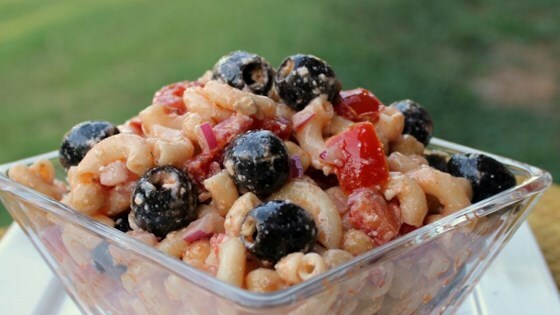 Mix macaroni with chickpea mixture. Cover, and refrigerate for at least 30 minutes to blend flavors. Great recipe! Next time I make it, though, I will reduce the amt. of salt (was a little salty), and add some chopped cucumber. I cut the black olives in half. I'll definitely make this again! Very tasty. I only added 1/2 of an onion and it was plenty and probably only 1/4 cup of olive oil. What a great combination with plenty of healthy ingredients. I love to make this salad, I like to add a seeded cucumber cubed! Yummy! Its so fresh and tastey!